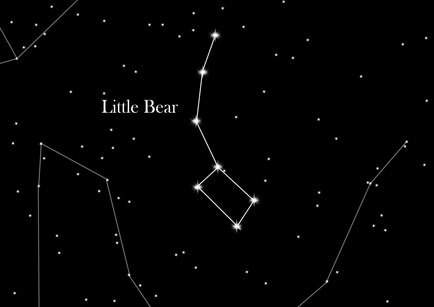 Also known as the 'Little Dipper', the Little Bear is one of the most important constellations in the sky to astronomers. The Little Bear (Ursa Minor in Latin, or 'smaller bear') is a constellation of the Northern sky. Visible from Europe throughout the year, it is occasionally referred to as the 'Little Dipper'. The main star of this constellation is Polaris, one of the most important stars in the sky to astronomers. All other celestial bodies seem to turn throughout a day using this star as a pivot. Polaris is also given a significant role in the legends of the Indian Vedas, being the leader of a group of gods. The Little Bear is similar in shape to the Great Bear, sometimes referred to as the 'Big Dipper'. This is why Ursa Minor is sometimes called the 'Little Dipper'. Unlike the Big Dipper, the 'handle' of the Little Dipper is not straight, but rather is bent upwards. The main star of the constellation, Polaris, remains fixed in its position in the night sky. The altitude of the star's position in the north corresponds to the viewer's latitude. Callisto was a beautiful nymph who attracted Zeus. She later gave birth to the god's son Arcas. Hera, the wife of Zeus, transformed Callisto into a bear. Years later, when Arcas was hunting in the woods, Hera made sure that Callisto encountered her son. Arcas was about to unintentionally kill his mother, when Zeus intervened. The god placed Callisto in the heavens as the Great Bear, and later made sure that Arcas joined her as the Little Bear.